Backpack CRUD allows you to show a filters bar right above the entries table. When selected or modified, they reload the DataTables results. The search will then search within the filtered elements. 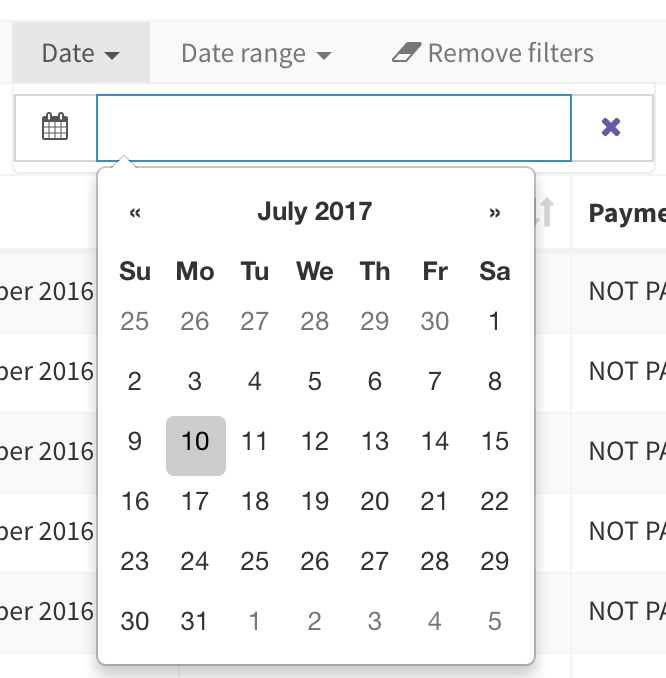 Just like with fields, columns or buttons, you can add existing filters or create a custom filter that fits to your particular needs. Everything's done inside your EntityCrudController::setup(). Only shows a label and can be toggled on/off. Useful for things like active/inactive and easily paired with Eloquent Scopes. The "Draft" and "Has Video" filters in the screenshot above are simple filters. Shows a text input. 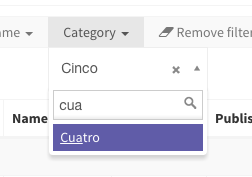 Most useful for letting the user filter through information that not shown as a column in the CRUD table - otherwise they could just use the DataTables search field. Show a datepicker. The user can select one day. Show a daterange picker. 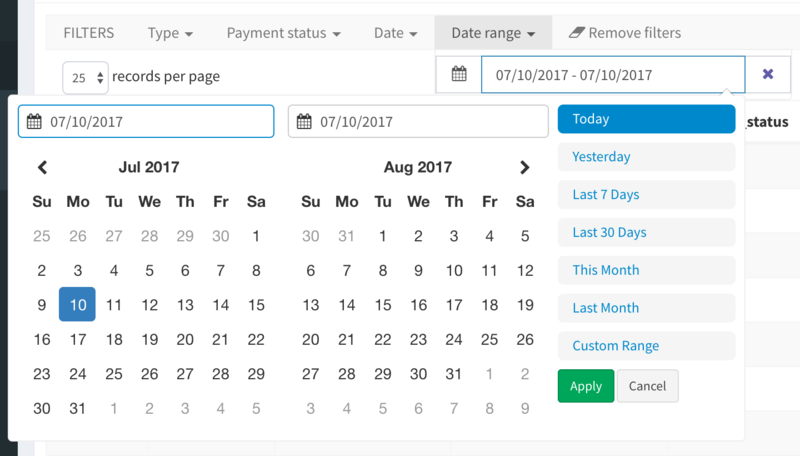 The user can select a start date and an end date. 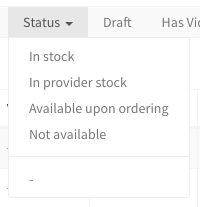 Shows a list of elements (that you provide) in a dropdown. The user can only select one of these elements. Shows a select2 and allows the user to select one item from the list or search for an item. Useful when the values list is long (over 10 elements). 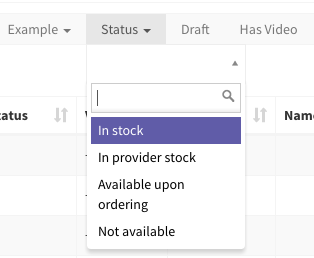 Shows a select2 and allows the user to select one or more items from the list or search for an item. Useful when the values list is long (over 10 elements) and your user should be able to select multiple elements. You can decide yourself if the query for each element should use 'where' or 'orWhere', in the third parameter of the addFilter() method. Shows a select2 and allows the user to select one item from the list or search for an item. This list is fetched through an AJAX call by the select2. Useful when the values list is long (over 1000 elements). Add the select2_ajax filter and for the second parameter ("values") specify the exact route. Shows two number inputs, for min and max. Display any custom column filter you want. Usually used by Backpack package developers, to use views from within their packages, instead of having to publish them. Creating a new filter type is as easy as using the template below and placing a new view in your resources/views/vendor/backpack/crud/filters folder. You can then call this new filter by its view's name (ex: custom_select.blade.php will mean your filter type is called custom_select). The filters bar is actually a bootstrap navbar at its core, but slimmer. 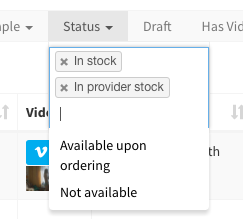 So adding a new filter will be just like adding a menu item (for the HTML). Start from the text filter below and build your functionality.